In February 2013, the director of Europol, the European Union’s law enforcement agency, made the shocking announcement that seven hundred international soccer matches had been fixed since 2008, including World Cup qualifying and exhibition matches, with a Chinese criminal syndicate pulling the strings. For the first time, investigative journalist Brett Forrest takes us inside the underworld of one of organized crime’s most profitable businesses—a $1 trillion annual international betting market, of which soccer comprises 70 percent. Forrest uncovered a web of nefarious dealings across the world, even on US soil. As he found, no match is safe—not even the World Cup tournament—and law enforcement officials lack the resources to stop it. But one man has taken this criminal enterprise on: Chris Eaton, former head of security for FIFA. Now with the International Center for Sports Security in Qatar, this rough and tumble Australian and longtime Interpol cop has tracked down some of the biggest fixers and their financial backers and continues his mission to clean up the world’s most popular sport. 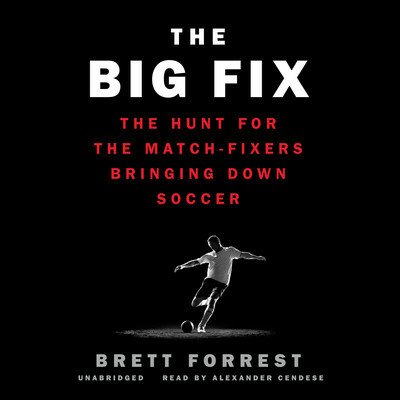 Filled with headline making revelations, The Big Fix is must reading for soccer fans and true crime aficionados.